The Siloam Springs, Arkansas trade area stretches beyond the city’s boundaries, extending approximately 25 miles to the north and south and 40 miles west along U.S. 412. Residents within this footprint regularly shop for goods and services in Siloam Springs. 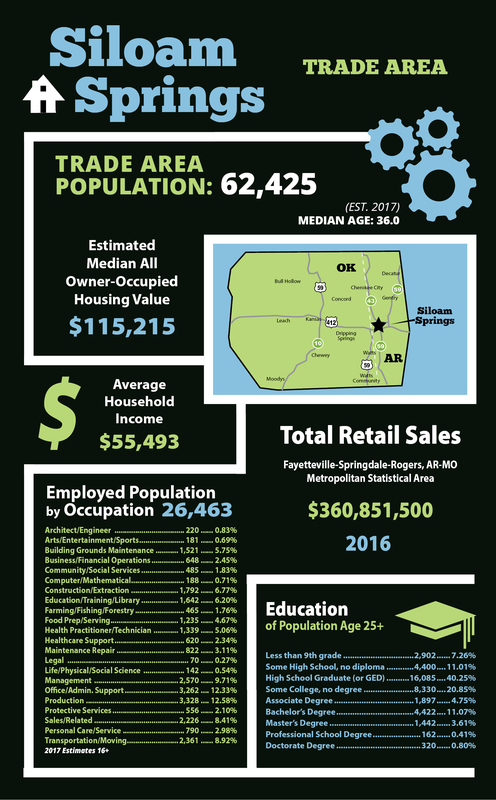 The following snapshot is a look at demographics and statistics within the Siloam Springs trade area. To see a snapshot of demographics and statistics within the City of Siloam Springs only, please click here. © 2019 Siloam Springs. All Rights Reserved.